Welcome to the October Issue of SailMaster - StartedSailing.com's Monthly Ezine, filled with information on tips, tricks, techniques to improve your sailing as well as stories and my experiences this month! If you like this Ezine, please 'pay it forward'. Pass it along to a friend or family member who is interested in Sailing/Boating/Yachting. They will thank you for it! 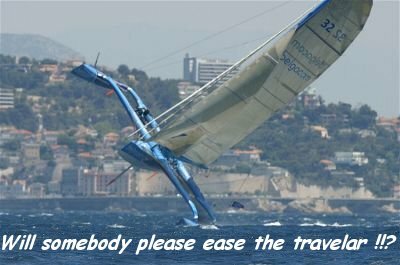 To pass it on just email them and ask them to look at "https://www.startedsailing.com/sailmaster-201009.html". Thank you for reading the October Issue of SailMaster. I have been so busy with work and school I have pretty much neglected this site and I apologise for that. I am in my final year and have had loads of work to do as well as my physics coursework, to finish. have also had to do my UCAS form (university application), which has taken up a lot of time. So not good. However on the flip side of the coin, the major extension to the website is still in ongoing progress, with around 50% of it completed. As well as this, Mark and I managed to set up an HD waterproof camcorder on the side of the boat, so that we could film us sailing from inside (and outside) the boat. The best way to learn is to see and do. The major extension to the website will have this at its core and will really help people who are struggling to learn how to sail. I am always looking for ways to improve the site. If you see any errors or would like to contribute in any way, please contact me! In the previous issue of this newsletter, I revealed that I had been asked a question from a woman who was studying at MIT about how close to the wind one can sail. I then decided that for my A-level physics coursework, I would conduct this experiment and I have done the experiment and written up my results. I promised that I would show them in this newsletter and a few of he had been emailing me to check on my progress, so here are the results. I found that at around 5 mph, the model boat can sail around 45 degrees from the wind. However at higher speeds the angle gets closer to the wind. At 15 mph, the model boat could sail at 35 degrees to the wind and at 30 mph and above the model boat could sail at 30 degrees to the wind. Despite the increase in wind strength, I was unable to get the model boat to sail any closer to the wind. So it has been settled, the closest a boat can sail to the wind is around 30 degrees and only in very strong winds. However, don't take my word for it! Take out your boat and a compass and see what you get! Email me you results and I will put them in next month's issue. Thank you for reading the October Issue of SailMaster! I hope you enjoyed it as much as I enjoyed writing it! Please feel free to contact me with any questions about this issue.